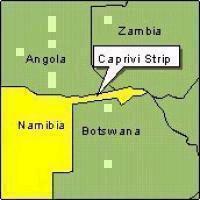 On behalf of the United Democratic Party (UDP) of the Caprivi Strip, I take this opportunity to direct our appreciations to all our members and supporters at Caprivi freedom.com, for the best support and relationship enjoyed in the year 2006. You our members and supporters had been our true partners and friends both on a national level (Caprivi Strip) and the international arena on both the African continent and many true peace loving continents abroad, in our search and advance for justice for the Caprivian people’s quest to self- determination and independence. To all human rights organizations and their advocates for peace and justice for humanity everywhere, we thank you and commend you for your continued advance and advocacy for peace and human rights to all. You have documented and investigated many human rights violations and injustices everywhere. Due to your determined efforts and continued activities Caprivians at home, abroad and those beloved sons, brothers and Heroes standing trial, in the Caprivi Treason Trial in Namibia, for their political beliefs for freedom, have benefited and hope to benefit even more in the New Year 2007. It is our wish and prayer that as our struggle for self –determination continue you shall strive with us as you had displayed in the past until our deserved freedom is attained. We embrace you and shall always count on your friendship, support and guidance as we advance the course of our existence and quest for freedom diplomatically. Our gratitude goes to all those Nations who have opened their doors to host and resettle Caprivians and still today continue to shoulder this noble responsibility, upholding the United Nations (UN) Charter for human rights. Caprivians today have found shelter, protection and peace because of your gracious hospitality and honor for human dignity and aspirations for peace everywhere. To your nationals, we say thank you for housing us in the past nine (9 YRS) today, and the future awaiting us. Your hospitality has granted us the most precious gift others have denied us, which is our pursuit for peace, freedom, justice and right to self – determination and development of our Motherland and preservation of such. We appeal for your continued patience, support and guidance as we struggle to attain our freedom. To you our supporters, we call upon your unwavering strength and support to free our beloved Motherland and our people from oppression, it is our hope your commitment shall grow even stronger as this assignment lingers before us. We applaud our brothers in the Namibian prisons and Botswana for their determination for freedom amidst challenging circumstance, to you we say hold on little longer peace and freedom comes in the morning. Our prayers, goes out to you all for your sacrifice, and that of your loved ones to bring about our deserved freedom, peace and prosperity for all Caprivians, the amount of your pain sacrifice is immeasurable. Please, bear with us this New Year 2007 as we make changes to this site, to better serve you our members and supporters. My fellow Caprivians, we need each other for a better tomorrow for all of us, join us as we pause to ask, What can I do to bring about this deserved freedom?